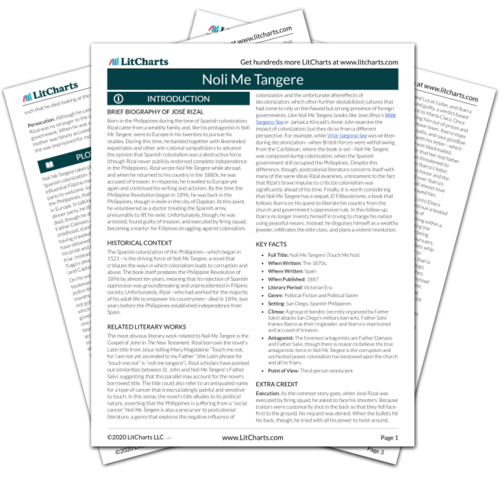 Instant downloads of all 942 LitChart PDFs (including Noli Me Tangere). 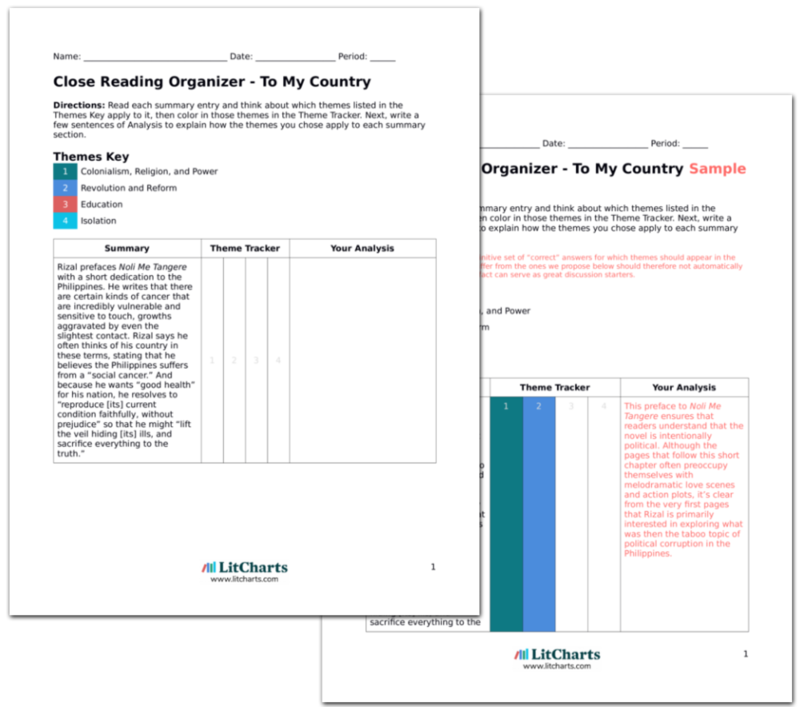 LitCharts assigns a color and icon to each theme in Noli Me Tangere, which you can use to track the themes throughout the work. Taking Ibarra out in his boat, Elías explains the plight of Captain Pablo and his followers. This turns into a discussion about reform, one in which Elías advocates for a total upheaval of the government. Ibarra, on the other hand, argues for a tactic that seeks to bring about change by working within the already established systems of power. He points out that “weakening the Civil Guard would only endanger the people’s security,” but Elías says that the Civil Guard does little other than terrorize the very people it claims to protect. Ibarra admits that their country is flawed, but he voices his faith in the prevailing “institution.” In response, Elías says that the government makes criminals out of honest citizens by ruining their lives and forcing them resort to crime. Elías’s claim that the government turns good citizens into criminals calls to mind what the young Crispín said in the bell tower when talking about the accusations that he stole money from the church; the boy told his brother that, because of how badly the sextons were punishing him, he wished he had actually stolen. At least that way he could pay back the sums and avoid further punishment. Of course, Ibarra’s optimism obscures his ability to see the truth in Elías’ argument, and his faith in religion and government renders him unable to acknowledge that it is difficult to address corruption using the same means by which that corruption flourishes. Ibarra and Elías’s political conversation continues. Elías succeeds somewhat in convincing Ibarra, but not completely. Rather, Ibarra decides to think these matters over more carefully before accepting to write to his influential friends in Madrid, who may be able to help improve the situation. Despite his agreement to think things over, though, he doubles down on his belief that the current institution benefits the Philippines, saying, “Have the Filipinos forgotten what they owe these orders? Have they forgotten the immense debt of gratitude they owe those who showed them the error of their ways and gave them faith […]?” He says that he thinks the friars are capable of helping the country, a statement that agitates Elías, who concludes that the reason Ibarra doesn’t understand is because he has never experienced true persecution. When Ibarra insists that Spanish colonialist powers “showed” Filipinos the “error of their ways,” he demonstrates the extent to which he has internalized the oppressive discourse promoted by colonialism, a practice that uses religion to justify greed and subjugation. Elías points this out by saying that Ibarra has never experienced persecution for himself, a statement that is more or less true, considering that Ibarra has lived a privileged life in Spain for the past seven years. Given the amount of opportunity Ibarra has been afforded, it’s no wonder that he doesn’t see the need for true revolution. Ibarra sees Elías’s frustration, acknowledging his friend’s “suffering” and utter discontent. Elías says that his misgivings about the country arise out of his personal experiences. “Perhaps knowing them will change my thoughts,” Ibarra says, encouraging his friend to tell him his life story in order to better express the origins of his views. One of the qualities that saves Ibarra from total ignorance is his willingness to remain open-minded in discussions regarding reform and revolution. Perhaps recognizing that his privilege has lent him a certain kind of unjustified power over his friend, he goes out of his way to consider Elías’s point of view, rendering him an empathetic character. Lannamann, Taylor. "Noli Me Tangere Chapter 49: Voice of the Persecuted." LitCharts. LitCharts LLC, 9 Nov 2017. Web. 20 Apr 2019. Lannamann, Taylor. "Noli Me Tangere Chapter 49: Voice of the Persecuted." LitCharts LLC, November 9, 2017. Retrieved April 20, 2019. https://www.litcharts.com/lit/noli-me-tangere/chapter-49-voice-of-the-persecuted.